The leguminous trees are reliable choices for the bee garden. Among these are a number of large trees, some of which are native. The group includes the widely popular honey locust as well as lesser known ones like the Japanese pagoda tree and the native yellowwood. An ideal plant for small gardens, this can produce multiple trunks. It is hardy to zone four. Amur maacki is native to Manchuria, Japan, and Korea. Of the six Asian species, this is by far the most popular. These trees are related to yellowwood. Slow growing, Amur maacki is usually 25 to 30 feet in height. In the wild, this can reach 45 feet. Mostly upright, it develops a rounded crown with spreading, arching branches and attractive, rich reddish-brown, peeling bark. The plants are named for Richard Maacki (1825-1886), a Russian naturalist. The tree was introduced to the U.S. in 1880. This outstanding plant bears alternate, compound, feather-like foliage, eight to 12 inches long. The opposite, oval to elliptic leaflets, seven to 11 in number, are up to 3½ inches in length. Initially silvery gray, these later turn deep green. The slightly winged, flat pods are three inches long and ½ inch wide. 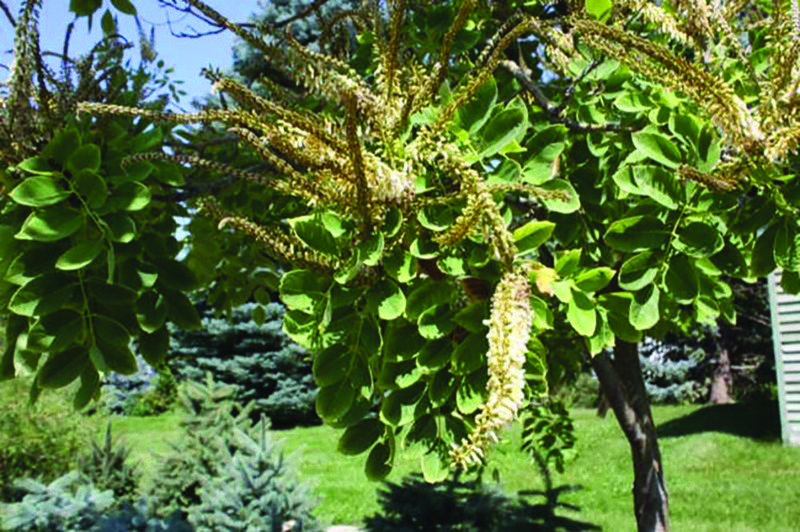 Amur maacki is a great Summer-blooming tree for bees. Its fragrant blossoms usually open in July and August. The delicately scented, pea-like flowers form long, dense, erect, upright, terminal clusters about six inches in length. They’re white with deep blue tinges. The individual blossoms are only about 1/3 inch long. Easy to grow, Amur maacki demands little routine care. Minimal pruning is required. This reliable plant needs no special growing conditions. It rarely suffers from serious disease or insects. Suited to full sun, the tree grows in almost any reasonably moist soil and adapts to a range of pH levels from acid to alkaline. Amur maacki tolerates both heavy and light soils. This species grows best in a moist, loose, well drained soil, especially a moist loam. It withstands wind and drought. Amur maacki is propagated by seed, softwood cuttings, and root cutting. Grafting is another option. A related species known as the Chinese maacki (Maackia chinensis) is also cultivated. It is slightly less hardy than Amur maacki. This species is similar except for the narrow, shorter leaflets and larger blossoms. Down covers its shoots, young leaves, and flowers. These trees bloom from mid to late Summer. As with most legumes, they produce nectar and pollen. Bees are very fond of the flowers. The trees are a source of surplus honey. Also called green wattle and early black wattle, this is native to eastern Australia and New South Wales. It is related to several native acacias found in the Southwest and along the Gulf Coast. Black wattle is hardy to zone nine. Widely planted in California, the tree has naturalized in some regions. This evergreen reaches 40 to 50 feet in height and is half as wide although it can sometimes be smaller. Black wattle is a handsome, spreading, upright, fast growing plant, which is sometimes shrubby. It features slender, sharply angled branches that can be hairy. The inner bark is reddish. The deep green, finely textured, feathery leaves are doubly compound with large numbers of linear leaflets, only 1/3 inch long. Seed pods are three to four inches in length. The bright to deep yellow, small, scented blossoms typically open from late Winter to early Spring, depending on the location. Forming spherical heads, the flowers appear on six-inch-long panicles. Suffering few insect or disease problems, this weak wooded, shallow rooted tree features limbs that tend to break easily during storms. Normally, black wattle requires little pruning. Several varieties of this fast growing tree are available. This needs full sun to partial shade. Adapted to both moist and dry conditions, black wattle is tolerant of salt. It thrives in most reasonably rich, well drained soils. 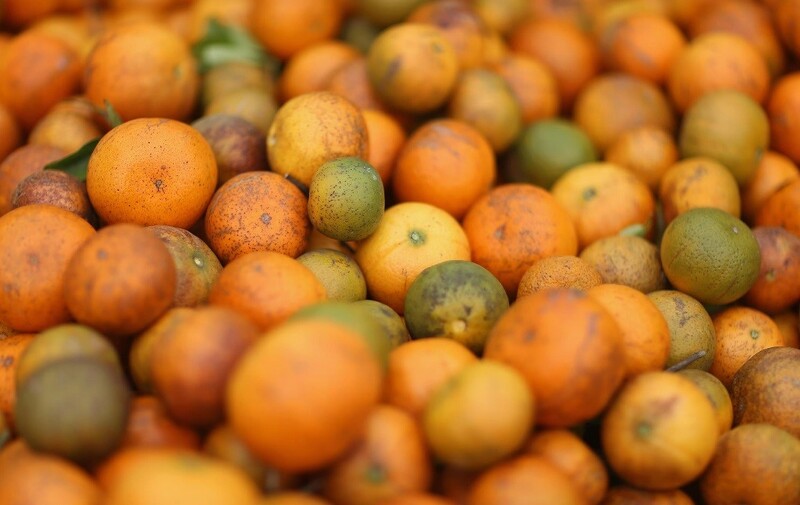 The species adapts to a range of pH levels from acid to neutral. The tree is called black wattle because early European settlers in New Zealand made mud-daubed wattle houses from its branches. In addition to black wattle, there are other related species that are similar. A number of these have naturalized in Florida and California. Black wattle is an excellent bee plant. 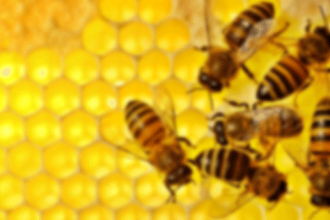 It is considered a major honey source in Hawaii and California. 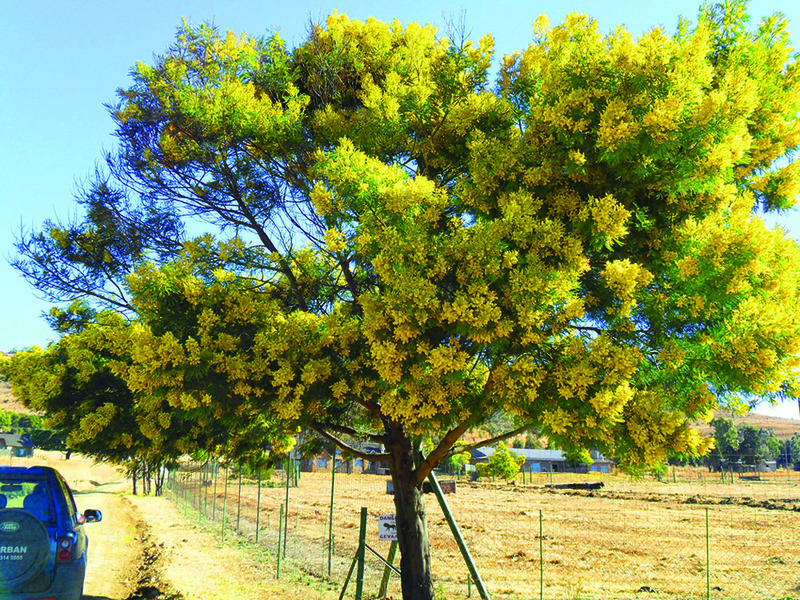 This tree is also called Chinese scholar tree and Japanese acacia. A very reliable, attractive, flowering ornamental species, it is hardy to zone six. In zone five, the plant sometimes experiences some Winter damage. Japanese pagoda tree is native to Japan, China, and Korea. Although a number of related species are cultivated around the world, this one is the hardiest. The plant is a very handsome, broad headed tree. Unlike most other legumes, it doesn’t fix nitrogen. The tree reaches 40 to 80 feet in height. A fast growing species, it can easily grow ten feet per year. The gray bark resembles that of ash. The stiff, drooping branches are very picturesque. The elegant, alternate, pinnately compound leaves are up to nine inches in length. The oval to narrow leaflets, varying from seven to 11 in number, occur in pairs except for the terminal one. Hairy underneath, the leaflets are two inches long. One variety has creamy white variegation on the foliage. The small, scented, pea-like blossoms form large, showy, terminal panicles. When in full bloom, this tree is absolutely gorgeous. It is covered with creamy white blossoms, ½ inch long. These open in Summer from late July to September. One cultivar has violet blooms. The flowers are similar to those of another native leguminous species – the yellowwood. The bean-like pods are three inches in length. Several varieties are available, including a columnar one. Needing full sun, Japanese pagoda tree adapts well to city conditions. It does best in poor to slightly rich soils. Tolerant of most soil types, this prefers a neutral to slightly acid pH. The tree adapts to rocky situations. Requiring minimal pruning, it is relatively free of pests and diseases. However, this can occasionally experience stem canker and twig blight, particularly in zone five. The latter is largely due to Winter damage. Japanese pagoda tree can be propagated from softwood cuttings and seeds as well as grafting and layering. Seeds, which should be planted soon after they’re harvested, can be slow to germinate. This exotic tree took a circuitous route in order to reach the West in 1647. A French Jesuit priest in Peking sent some seeds via a Russian caravan, which stopped in Peking about every three years, to a botanical garden in Moscow. Later, some seed-grown plants were sent from Moscow to a Paris botanical garden. The plant was introduced to England in the 1750s and the U.S. in 1811. Upon arriving in New York City at the Elgin Botanical Garden, which was located from about 1801-1810 on the site where Rockefeller Center was later built, the trees were initially grown in greenhouses. At that time, little information on their hardiness was available. Now, this is mainly grown in the East as a shade tree. The plant was widely used in its homeland as a shade and street tree, especially in Canton and Peking. In China, it was called the scholar tree because it was planted as a shade tree around the graves of Chinese scholars and mid-level Chinese government officials. There are related cultivated and native species. Pagoda tree or vetchleaf sophora (Sophora davidii) is a shrubby introduced form that blooms in June. Texas sophora or coralbean (Sophora affinis) occurs from Louisiana to Texas and Oklahoma. This native forms thickets and grows mostly in limestone areas, along streams, and ravines. Mescalbean or coral bean (Sophora secundiflora), also called Texas mountain-laurel, is native throughout the Southwest. This forms thickets and frequents wet places, especially along streams. It occurs in coastal areas as well as in the mountains to 5000 feet elevation. All of these species provide nectar and pollen for a month or more. They’re considered valuable trees for bees, who eagerly work the flowers. Lengthy wet periods can interfere with the nectar flow. Hot weather brings the best flows. Each blossom yields two mg of nectar daily, which contains 40 per cent sugar. In the past, reports indicated that bees were poisoned by Japanese pagoda blossoms in Central Europe. However, this was never substantiated, and was apparently linked to certain climatic conditions. 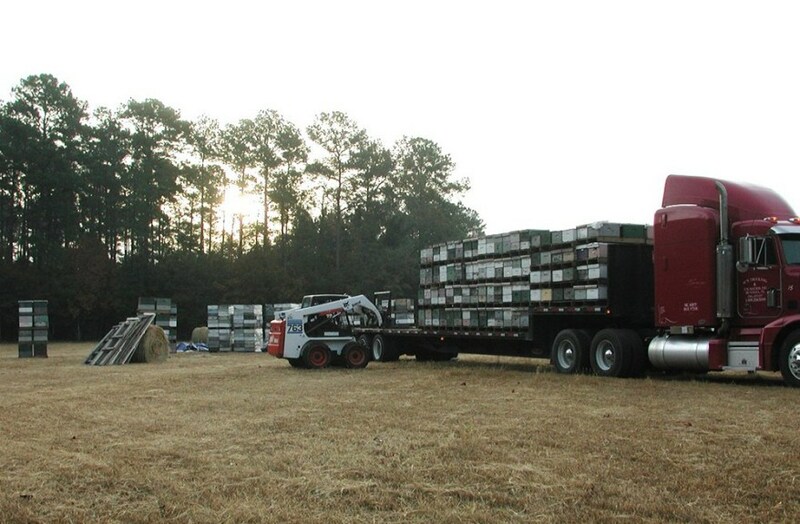 When enough of the trees are available, this can provide surplus honey of over 50 pounds per colony. In Europe, the trees yield about 300 pounds per acre. The honey has a pronounced flavor. Recommended for zones four through eight, this attractive, long lived, slow growing native is an excellent flowering tree for the bee garden. It was discovered by Andre Michaux, a French botanist, in March of 1796 near Fort Blount, which was located about sixty miles from Nashville, Tennessee. He originally classified it as Sophora because it resembled the Japanese scholar tree. Later, the genus name was changed to Cladrastis. The common name refers to the yellow heartwood, which once served as a dye. Within its range, this tree is relatively rare. It occurs most frequently on forest slopes in rich limestone soils. Yellowwood is native over a wide area. Its range extends from Ohio, Indiana, Illinois, Kentucky, and Tennessee into the Southeast. The trees that now occur in Oklahoma, Missouri, and Arkansas are believed to be ones that naturalized after some trees were planted in the area. Yellowwood reaches 30 to 55 feet in height. With a relatively moderate growth rate, it typically grows to about 20 feet tall within 25 years. However, the tree can take 50 years to reach its mature height. This low branching plant has a broad, rounded, graceful, compact shape. With a forked trunk, it features zigzag branches and lovely smooth gray bark. Its petioles are swollen at the base. The alternate, feathery, bright green leaves are pinnately compound. The oval leaflets, which number 5 to 11, are in pairs with an odd one at the end. They’re four inches long with the terminal one being larger. These turn yellow in the Fall. This tree is a vision of beauty when in full bloom for it is clothed with blossoms. 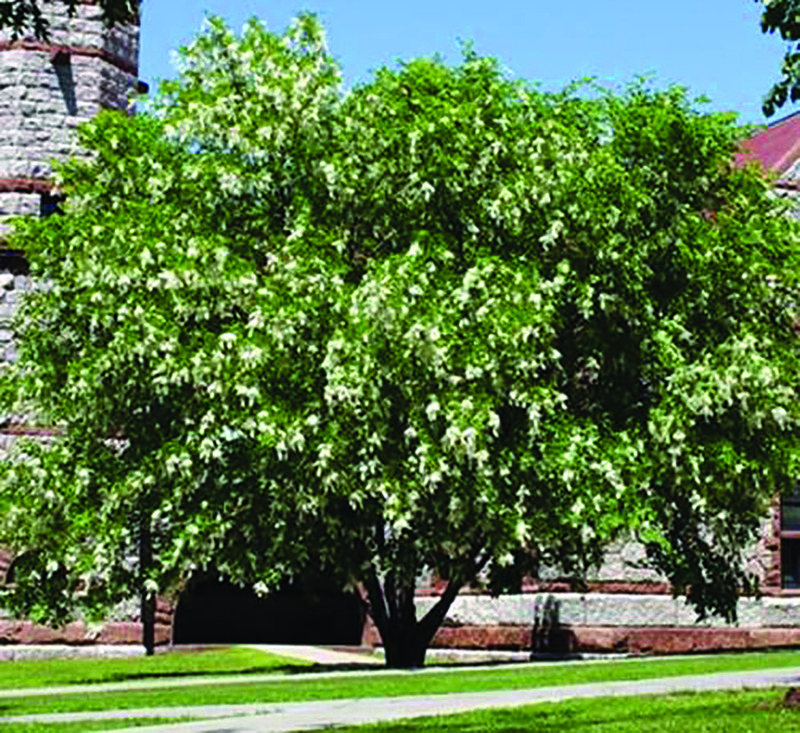 Yellowwood tends to bloom heavily during May and early June in alternate years. It begins flowering at a very young age. With five petals, the delicate white blooms open just as the leaves have started to unfold. These are very fragrant, especially at night. They appear in long, showy, loose, dense, terminal, drooping panicles, up to 1½ feet long. Wisteria-like, the flowers feature a bell-like calyx. The individual blooms are over an inch in length. A pink flowering variety is available. The narrow, oblong, flat pods are four to five inches in length. Ripening in August or so, they resemble those of redbuds. Grown as a shade and flowering tree, the species is hardy to zone three. Full sun is best, but it adapts fairly well to partial shade. This has some resistance to wind. Yellowwood is adapted to moist and slightly dry soils. The tree thrives in moist, rich, well drained soils, especially those found along waterways. Tolerant of various pH levels from slightly neutral to somewhat acid, it prefers a limestone-rich soil. Bareroot yellowwood trees don’t transplant well. If pruning is needed, this should be done from Summer through late Fall. Easy to grow from seed, yellowwood can also be propagated from root cuttings. The plant usually has few insect or disease problems. There are several related species native to Asia. Japanese yellowwood (Cladrastis platycarpa) is slightly smaller. Considered a good nectar and pollen source, yellowwood flowers invariably attract lots of bees. Wherever the trees are plentiful, the plants provide a surplus honey. This is light amber with a strong distinctive flavor.